Topic: How did you hear about us? 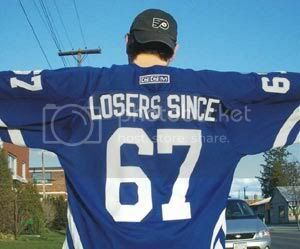 I think I really first found the site on a link on TMLFANS.com. My wife found it long ago (well before we were married), she joined, and then I joined, she became less active afterward and blames me for it. No.... he moved to Pembroke a few years back. I havent spoken with him in quite some time. I do believe that they have two rugrats now. So come Feb I am expected to be AWOL then eh? Edit: She found it with google. I'm pretty sure through Google. My patience is wearing pretty thin with the emergence of legions of anti-moxites. Don't worry man, the P.P.A brotherhood always stick together. I threw a rock in the water and the ripples spelled out the site name. But I didn't come right away. Then I saw it spelled out in the stars, but that still wasn't enough. Then a Leaf fan had it on the back of their sweater -- If that's not a sign, I don't know what is! ...or I found it on Google. Either way. Altavista?!?!?!?!? Now there's a name out of the internet's history books. I used to mainly be at the alt.sports.hockey.nhl.ott-senators newsgroup and checked out the Sens official board a bit. Not sure which I heard about it from first but was ready for a more civilized place. There are good coaches and there are bad coaches, the real question is "Do you want this person to be a role model to your kids for the next 6 months". That's the question you have to ask yourself. Go Sarnia Jr. Sting Minor Midget MD!!!!! Most of my clips end up on there thanks to Szuper. BTW, I won't be capping this season. Tooo Busy so someone else will have to fill the void.